Did Trump Hand His Cuban Exile Fans A Meaningless Move On Title III? Cuban workers in front of the Melia Cohiba hotel in Havana, one of the foreign investments that may be standing on property seized from Cuban exiles by the communist revolution. Cuban exiles and other foes of Cuba's communist government woke up Monday morning hearing that President Trump was going to get tougher on the regime. Specifically, they expected Trump to activate an unused tool of the Cuban embargo known as Title III. He did. But what they got instead was more of a letdown than a crackdown. WLRN's Luis Hernandez spoke with Americas correspondent Tim Padgett about Title III – and why a lot of Cuban-Americans right now say it's still an unused tool. HERNANDEZ: Tim what is Title III – and why is it such a big deal to folks who want to see an end to communism in Cuba? PADGETT: Title III is often called the strongest weapon in the Cuban embargo arsenal. It's part of the 1996 Helms-Burton law that tightened the embargo. And it lets Americans – in this case mostly Cuban exile families – go to U.S. federal court and sue companies that use property in Cuba that was taken from them by the communist revolution back in the 1960s. So we're talking about potentially thousands of lawsuits claiming millions of dollars. But the larger hope was that it would have a chilling effect on foreign investment in Cuba. The thinking was that it would undermine the island's already threadbare economy and therefore undermine the regime itself. READ MORE: Does Baseball Deal Help Cuban People or Cuban Regime? Trump May Decide. So why has no U.S. president ever exercised the option to put Title III into action? Because those presidents worried that other countries, like Spain and Canada that have a big business presence in Cuba, could retaliate. They can turn around and do the same thing to U.S. companies somewhere else. They didn't want to risk that. Trump is exempting the European and other foreign companies that are the biggest and ripest Title III targets. So for a lot of Cuban-Americans this is just a symbolic if not meaningless move. "All the presidents, both Democrat and Republican, perceived Title III as something that would be detrimental to U.S. interests – particularly business interests." President Trump seemed willing to risk it as a way of paying back the more hardline Cuban exile voters here who he feels helped him win Florida in the 2016 election. Can we say that President Trump is actually implemented Title III now? Technically, yes. Practically, no. What he did say was U.S. citizens may now sue Cuban companies that use confiscated property. But that's really all but meaningless to the property claimants, because even if they win their lawsuit here they really can't expect to collect any money from a Cuban entity. What's most significant is that Trump is exempting European and other foreign companies that do business in Cuba – in other words, the very companies that are the biggest and ripest Title III targets for these claimants. going to have a lot of different foreign owners. Definitely one of the ground zeros." Even if Trump included foreign companies, would activating Title III really work? That's what we thought we were going to find out. But there's no certainty that it would work. It would be hard to collect from companies that don't have assets in theU.S., for example. On top of that, a lot of countries like Canada have passed laws that don't allow money from Cuban embargo-related lawsuits to be collected inside their borders. Still it's likely that it would have created enough uncertainty for companies to have that chilling effect on foreign investment in Cuba. Are Cuban exiles who voted for Trump feeling let down right now? 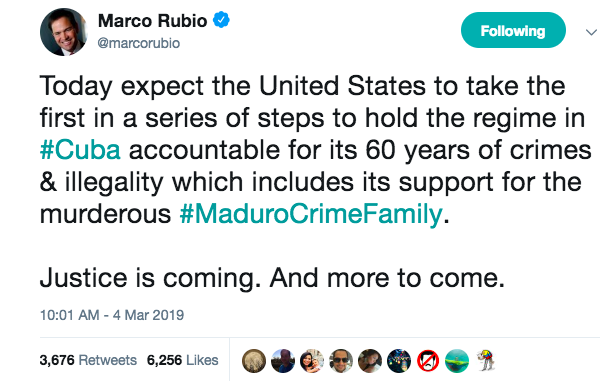 Well, Florida Senator Marco Rubio, who is Cuban American and was pushing Trump to activate Title III, tweeted that this is just a "first step" and that "justice is coming." "I'm hopeful that while this is just symbolic, with no real teeth, it is the first step towards something that does have real teeth." But if you're a Cuban exile and you expected Trump to roll back normalized ties between the U.S. and Cuba – yeah, you're probably wondering if you're getting your bang for your vote. U.S. Secretary of State Rex Tillerson suspended — for another six months — a provision in the Helms-Burton Act that would allow more Americans, including nationalized Cubans, to sue those on the island who have been “trafficking” in private properties confiscated decades ago by the Cuban government. Florida Roundup: Property Claims In Cuba And U.S. The U.S. and Cuba may have embassies in each other’s countries, but relations are far from normal. Human rights, basic freedoms and an open economy continue to be major areas of friction between the two. For the first time, negotiators tackled the contentious issue of reparations this week. American companies and Cubans in America want billions for property confiscated two generations ago when Fidel Castro and the communists seized power. Homes, businesses, shops, factories, farms -- they were all just taken by the revolution. Export Tax A Good Way To Stick It To Cuba? Or A Good Way For Cuba To Stick It To Us? While South Florida breathlessly awaits President Trump’s decision on whether to roll back his predecessor’s normalization of relations with Cuba, something else is happening in Washington that could nudge normalization forward – or severely set it back. Did President Trump Lay Out A Cuba Case In Miami – Or A Cuba Con?